The view of caldera from the island of Santorini. 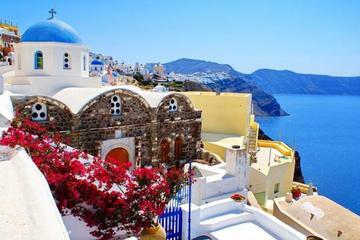 ​The Greek Cyclades is a gorgeous collection of beautiful islands. 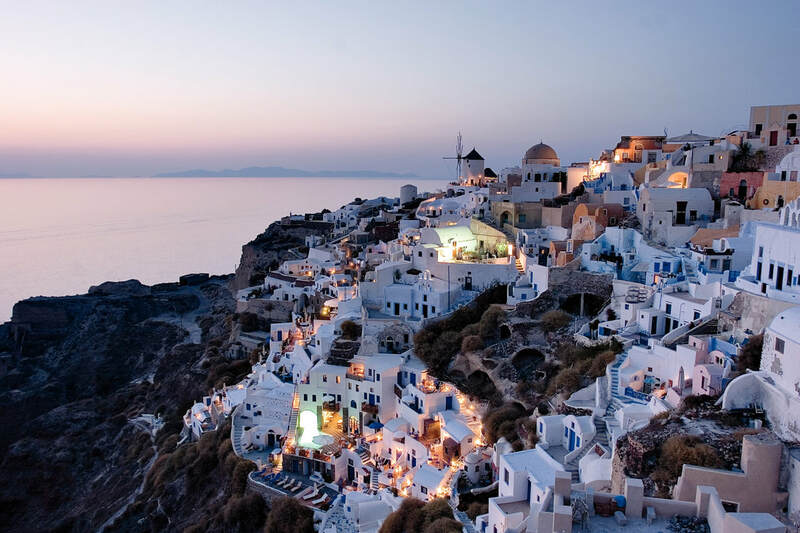 The southernmost area in this island collection is Santorini. This is the island that most often adorns tourist brochures welcoming visitors with its fantastic landscape. Guests will tell you that photographs can hardly do this place justice. 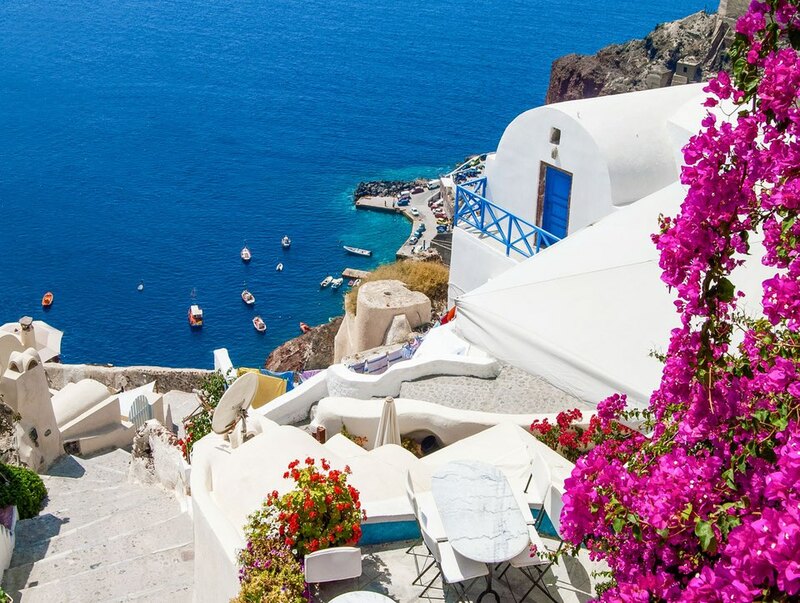 Famous for its caldera, the collection of cliffs bordering the Aegean Sea that in ancient times was an active volcano, Santorini is one of the Cyclades most prized possessions. Santorini. Oia. Photo by Y. Skoulas, courtesy of the Greek National Tourism Organization. Geologically, the island of Santorini offers the visitor a spectacular sight. The western side of the island is stacked with houses that sit perched atop sharp cliffs thrusting toward the sea. The eastern side of the island is a tourist's paradise, with calm beaches stretching as far as the eye can see. 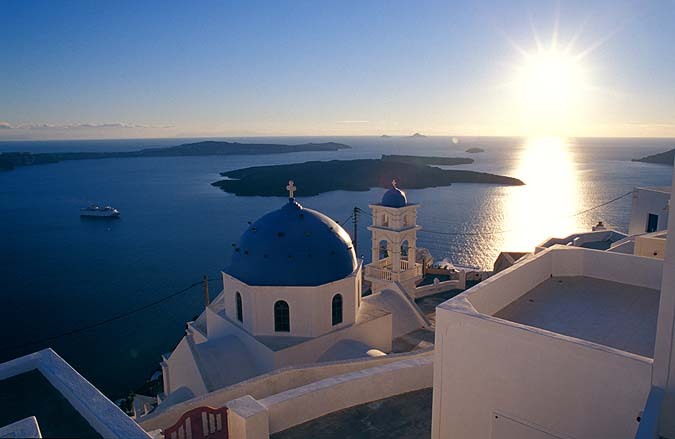 ​​Santorini has two main towns, Oia to the north and Fira in the center of the island. Both towns sit atop the caldera and are visible upon your arrival to the island. Fira, Santorini's capital, is the livelier of the two towns. It gives visitors plenty of opportunities to indulge themselves and their wallets. Oia is a tamer town, catering especially to visitors looking to slow down and enjoy the scenery. 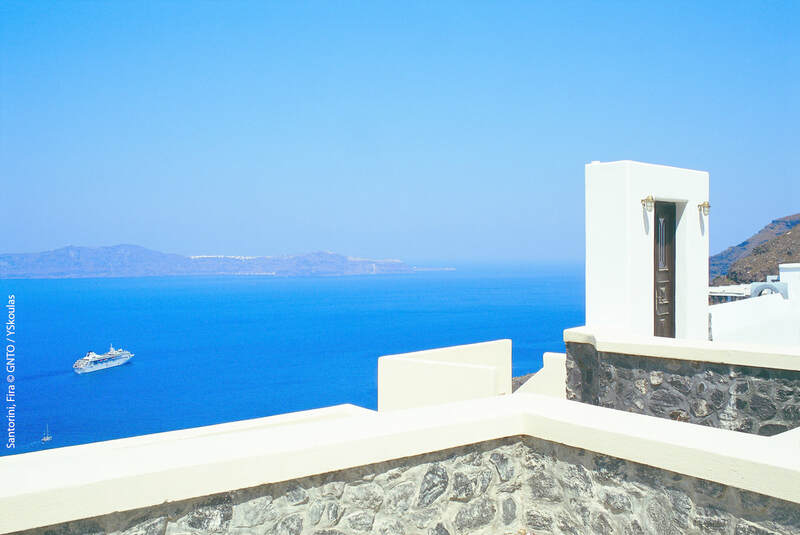 With a decidedly residential tone, Oia emphasizes the beauty of its land and invites visitors to unwind and take in the famous sunset on any of its caldera's peaks. With over a million tourists per year, Santorini is constantly packed. And the 7,000 residents of the island have made their home an inviting destination by opening shops, nightclubs and restaurants in abundance. By day, it is a sparkling place of water and relaxation. At night, it comes alive as its tone is transformed from placid to party. Local wine is the islands largest export, and the incredible selection undoubtedly adds to the festive atmosphere the island takes on after dark. Tavernas are packed with tourists who simply want to taste the flavors and sample Santorini's finest. Santorini. Fira. Photo by Y. Skoulas, courtesy of the Greek National Tourism Organization. ​In 1967, archaeologists on Santorini unearthed the remains of a Bronze Age city that may have been home to as many as 30,000 people. Whether the Lost Continent of Atlantis is rooted in myth or reality, an undisputed fact remains. The eruption of the volcano created a caldera - and one of the most dramatic land and seascapes in the entire Mediterranean. On Santorini, whitewashed buildings cling to vertiginous cliffs that plunge to a turquoise sea. Part of the Cyclades Archipelago, the three-island group of Santorini, Thirasia and uninhabited Aspronisi present the traveler with unforgettable vistas. The island has had a number of names throughout history - from Strongyle or "Round", to Thera in honor of an ancient hero. Santorini is more recent and stems from the island church dedicated to St. Irene - Santa Rini to foreign sailors. The view from the deluxe Perivolas Hotel in Oia. For a line of products by Airportag, the best Aviation and Travel Gift Shop, on the Santorini Airport check here! At the northern tip of Santorini lies the charming Greek village of Oia, known for its picturesque architecture, cobblestone lanes, pristine whitewashed buildings and a host of welcoming cafes, shops and blue-domed churches. Perched on the edge of a dramatic cliff, the island's capital boasts a stunning combination of Cycladic and Venetian architecture, outstanding views of the submerged volcano and an aerial cable car transportation system. At the location of Mesa Gialos stands the Megaro Gyzi, the building housing the Santorini archaeological collection. It includes sculptures, inscriptions, vases and figurines, but also the huge volcanic rock, weighing 480 kilos, which according to legend was once lifted by the ancient weightlifter Eumastas, and the Theran amphora with geometrical decoration dating from the beginning of the 7th century BC. A treasure trove of history and culture, this museum contains an excellent collection of artifacts found in excavations throughout the area, including the archaeological site of Akrotiri. The museum tells the story of prehistoric Thera through a variety of finds from excavations and collections, making up the dynamic image of an island which was a significant commercial and economic center in the Aegean during the 18th and 17th centuries BC. These uninhabited islands, located in the center basin of Santorini, were created by a series of volcanic eruptions 3,500 years ago. Jagged black lava and therapeutic hot springs characterize their extraordinary landscape. This region is famous for world-class wines and unique vinification methods. Visit some of the world's oldest vineyards and learn how the micro-climate and rich volcanic soil produces such a full-bodied bouquet. For a link to a page maintained by Santorini wineries, click here! This seaside village, on the southeast side of Santorini, is famous for its expansive and dramatic black sand beach. Created by volcanic activity, this area is teeming with watersports, cafes and tavernas. A volcanic eruption around 1650 B.C. caused the center of the island to implode into the sea, forming a huge water-filled crater called the "caldera," which legend proclaims to be the lost city of Atlantis. The island's highest point towers 2,000 feet above the sea and offers panoramic views of Santorini. 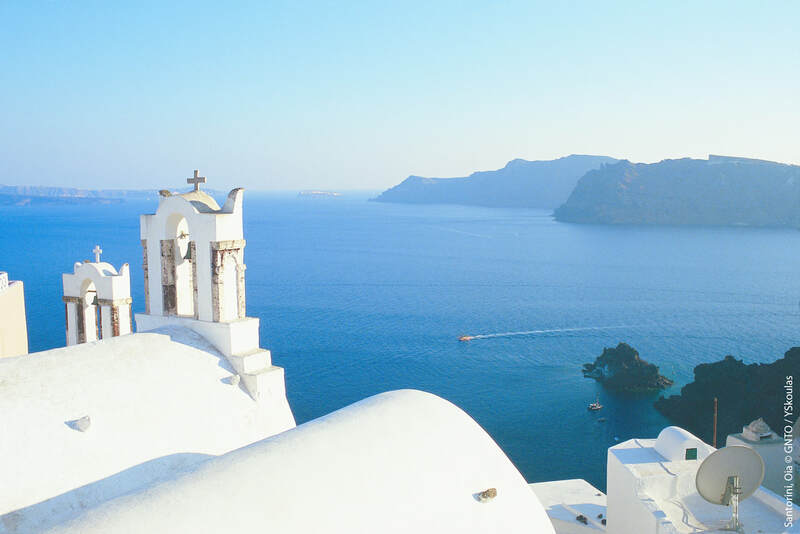 Explore Santorini in this 4-hour private tour. Visit wineries to taste the famous local wines and explore traditional villages like Oia, Fira and Pyrgos. Enjoy great views of the brilliant flooded caldera, stroll above the rooftops of houses carved into the rock and gaze into the deep blue waters of the caldera far below. Santorini is the most spectacular of the Cycladic islands!